Research Grants: Natural Environment Research Council (NERC - UK), Engineering and Physical Sciences Research Council (EPSRC - UK), Economic and Social Research Council (ESRC - UK), Royal Society (Africa Awards), Hydrologic Sciences Program - National Science Foundation (NSF - USA), British Council (PMI 2 Connect Research Awards). Journals: Applied Vegetation Science; Area; Earth Surface Processes and Landforms; Ecological Economics; Ecological Modelling; Environment and Planning B; Environmental Conservation; Environmental Management; Environmental Modelling and Software, Environmental Monitoring and Assessment; Hydrobiologia; Hydrological Processes; Hydrological Sciences Journal; Hydrology and Earth System Sciences; Hydrology Research; International Journal of Disaster Risk Science; International Journal of Remote Sensing; International Water Management Institute Research Reports; Journal of Coastal Conservation; Journal of Environmental Management; Journal of Hydrology; Journal of Hydrology: Regional Studies; Marine and Freshwater Research; Natural Resources Forum; Polish Journal of Environmental Studies; Quaternary International; River Research and Applications, Science of the Total Environment, Water, Air and Soil Pollution, Water Resources Research, Wetlands. Thompson, J.R., Hollis, G.E. (1997), Wetlands and Integrated River Basin Management: Experiences in the Asia Pacific: Part I,Wetlands and Integrated River Basin Management: series. Nairobi and Kuala Lumpur: United Nations Environment Programme & Wetlands International Asia Pacific. Meynell, P.J., Thien, N.G., Ni, D.V., Triet, T., van der Schans, M., Shulman, D., Thompson, J.R., Barzen, J., Shepherd, G. (2012). An integrated fire and water management strategy using the ecosystem approach: Tram Chim National Park, Vietnam. in Gunawardena, E.R.N., Gopal, B., Kotagama, H.B. (ed.) Ecosystems and Integrated Water Resources Management in South Asia. New Delh & Abingdon: Routledge 199-228. Maltby, E.B., Ormerod, S., Acreman, M.C., Blackwell, M., Durance, I., Everard, M., Morris, J., Spray, C., Biggs, J. Boon, P., Brierley, B., Brown,L., Burn, A., Clarke, S., Diack, I., Duigan, C., Dunbar, M., Gilvear, D., Gurnell, A., Jenkins, A., Large, A., Maberly, S., Moss, B., Newman, J., Robertson, A., Ross, M., Rowan, J., Shepherd, M., Skinner, A., Thompson, J.R., Vaughan, I., Ward, R (2011). Freshwaters – Openwaters, Wetlands and Floodplains In: The UK National Ecosystem Assessment Technical Report. UK National Ecosystem Assessment, UNEP-WCMC: Cambridge., 295–360. Baker, C., Thompson, J.R., Simpson, M. (2009). Hydrological dynamics I: Surface waters, flood and sediment dynamics. in Maltby, E.B., Barker, T. (ed.) The Wetlands Handbook. Chichester: Wiley-Blackwells, 120-168. Kingsford, R.T., Lemly, A.D., Thompson, J.R. (2006). Impacts of dams, river management and diversions on desert rivers. in Kingsford, R.T. (ed.) Ecology of Desert Rivers. Cambridge: Cambridge University Press, 203-247. Kingsford, R.T., Thompson, J.R. (2006). Desert or dryland rivers of the world – an introduction. in Kingsford, R.T. (ed.) Ecology of Desert Rivers. Cambridge: Cambridge University Press, 3-10. Al Khudhairy, D.H.A., Calaon, R., Leemhuis, C., Hoffman, V., Shepherd, I.M., Thompson, J.R., Gavin, H., Gasca-Tucker, D., Refstrup Sørensen, H., Refsgaard, A., Bilas, G., Zalidis, G. (2001). Innovative Technologies for Scientific Wetland Management and Conservation. in Owe, M., Brubaker, K., Ritchie, J., Rango, A. (ed.) Remote Sensing and Hydrology. Wallingford: IAHS Press, Public edition, 491-494. Thompson, J.R., Finlayson, C.M. (2001). Freshwater Wetlands. in Warren, A., French, J.R. (ed.) Habitat Conservation: Managing the Physical Environment. Chichester: Wiley, 147-178. Thompson, J.R. (2000). Structure de gestion des basins versants. in Vers une Gestion Durable des Plaines d'Inondation Saheliennes (ed.) Groupe d'Experts des Plaines d'Inondation Saheliennes (GEPIS). Gland, Switzerland and Cambridge, UK: UICN, 113-116. Polet, G., Thompson, J.R. (1996). Maintaining the Floods: Hydrological and Institutional Aspects of Managing the Komadugu Yobe Basin and its Floodplain Wetlands. in Acreman,M.C., Hollis,G.E. (ed.) Water Management and Wetlands in Sub Saharan Africa. Gland: IUCN, 73-100. Thompson, J.R. (1996). Africa's Floodplains: A Hydrological Overview. in Acreman, M.C., Hollis, G.E. (ed.) Water Management and Wetlands in Sub Saharan Africa. Gland: IUCN, 5-20. Hollis,G.E., Penson,S.J., Thompson,J.R. (1993). Hydrology of the River Basin. in Hollis, G.E., Adams, W.M., Aminu-Kano, M. (ed.) The Hadejia Nguru Wetlands: Environment, Economy and Sustainable Development of a Sahelian Floodplain Wetland. Gland & Cambridge: IUCN, 19-68. Hollis, G.E., Thompson, J.R. (1993). Hydrological Model of the Floodplain. in Hollis, G.E., Adams, W.M., Aminu-Kano, M. (ed.) The Hadejia Nguru Wetlands: Environment, Economy and Sustainable Development of a Sahelian Floodplain Wetland. Gland & Cambridge: IUCN, 69-80. Hollis, G.E., Thompson, J.R. (1993). Water Resource Developments and their Hydrological Impacts. in Hollis, G.E., Adams, W.M., Aminu-Kano, M. (ed.) The Hadejia Nguru Wetlands: Environment, Economy and Sustainable Development of a Sahelian Floodplain Wetland. Gland & Cambridge: IUCN, 149-190. Durkota, J.M., Wood, P.J., Johns, T., Thompson, J.R., Flower, R.J. (2019). Distribution of macroinvertebrate communities across surface and groundwater habitats in response to hydrological variability. Fundamental and Applied Limnology. Fast Track Published Online. Duncan, C., Owen, H.J.F., Thompson, J.R., Koldewey, H.J., Primavera, J.H., Pettorelli, N. (2018) Satellite remote sensing to monitor mangrove forest resilience and resistance to sea level rise. Methods in Ecology and Evolution 9, 1837-1852. Mao, D., Wang, Z., Yang, H., Li, H., Thompson, J.R., Li, L., Song, K., Chen, B., Gao, H., Wu, J. (2018). Impacts of climate change on Tibetan lakes: patterns and processes. Remote Sensing 10(3), 358. Yang, H., Ma, M., Thompson, J.R., Flower, R.J. (2018). Waste management, informal recycling, environmental pollution and public health. Journal of Epidemiology and Community Health 72, 237–243. House, A.R. Thompson, J.R., Roberts, C., de Smeth, K., Old, G., Acreman, M.C. (2017). Projecting impacts of climate change on habitat availability in a macrophyte dominated chalk river. Ecohydrology. 10 eco.1823. Thompson, J.R., Crawley, A. Kingston, D.G. (2017). Future river flows and flood extent in the Upper Niger and Inner Niger Delta: GCM-related uncertainty using the CMIP5 ensemble. Hydrological Sciences Journal. 62, 2239–2265. Thompson, J.R., Iravani, H., Clilverd, H.M., Sayer, C.D., Heppell, C.M., Axmacher, J.C. (2017). Simulation of the hydrological impacts of climate change on a restored floodplain. Hydrological Sciences Journal. 62, 2482–2510. Yang, H., Xia, J., Thompson, J.R., Flower, R.J. (2017). Urban construction and demolition waste and landfill failure in Shenzhen, China. Waste Management. 63, 393–396. Clilverd, H.M., Thompson, J.R., Heppell, C.M., Sayer, C.D. Axmacher, J.C. (2016). Coupled hydrological/hydraulic modelling of river restoration impacts and floodplain hydrodynamics. River Research and Applications. 32, 1927-1948. Duncan, C., Primavera, J.H., Pettorelli, N., Thompson, J.R., Loma, R.J.A., Koldewey, H.J. (2016). Rehabilitating mangrove ecosystem services: A case study on the relative benefits of abandoned pond reversion from Panay Island, Philippines. Marine Pollution Bulletin. 109, 772-782. Ho, J.T., Thompson, J.R., Brierley, C.B. (2016). Projections of hydrology in the Tocantins-Araguaia Basin, Brazil: uncertainty assessment using the CMIP5 ensemble. Hydrological Sciences Journal. 61, 551-567. House, A.R., Thompson, J.R., Acreman, M.C. (2016). Projecting impacts of climate change on hydrological conditions and biotic responses in a chalk valley riparian wetland. Journal of Hydrology. 534, 178–192. House, A.R., Thompson, J.R., Soresnson, J.P.R., Roberts, C., Acreman, M.C. (2016). Modelling groundwater/surface-water interaction in a managed riparian chalk valley wetland. Hydrological Processes. 30 447-462. Lai, L., Huang, X. Yang, H., Chuai, X. Zhang, M., Zhong, T., Chen, Z. Chen, Y., Wang, X., Thompson, J.R. (2016). Carbon emissions from land-use change and management in China between 1990 and 2010. Science Advances. 2, e1601063. Li, Y., Thompson, J.R., Li, H. (2016). Impacts of spatial climatic representation on hydrological model calibration and prediction uncertainty: A mountainous catchment of Three Gorges Reservoir Region, China. Water. 2016, 8, 73. Rahman, M.M., Thompson, J.R., Flower, R.J. (2016). An enhanced SWAT wetland module to quantify hydraulic interactions between riparian depressional wetlands, rivers and aquifers. Environmental Modelling & Software 84, 263–289. Thompson, J.R., Crawley, A., Kingston, D.G. (2016). GCM-related uncertainty for river flows and inundation under climate change: The Inner Niger Delta. Hydrological Sciences Journal 61, 2325-2347. Duncan, C., Thompson, J.R., Pettorelli, N. (2015). The quest for a mechanistic understanding of biodiversity-ecosystem services relationships. Proceedings of the Royal Society B. 282: 20151348. Yang, H.,Huang, X., Yang, Q., Tu, J., Yang, D., Xia, H., Flower, R.J., Thompson, J.R. (2015). Water requirements for shale gas fracking in Fuling, Chongqing, Southwest China. Energy Procedia. 76, 106–112. Thompson, J.R., Green, A.J. Kingston, D.G. (2014). Potential evapotranspiration-related uncertainty in climate change impacts on river flow: An assessment for the Mekong River basin. Journal of Hydrology. 510, 259–279. Thompson, J.R., Laizé, C.L.R., Green, A.J., Acreman, M.C., Kingston, D.G. (2014). Climate change uncertainty in environmental flows for the Mekong River. Hydrological Sciences Journal 59, 935-954. Clilverd, H.M., Thompson, J.R., Heppell, C.M., Sayer, C.D., Axmacher, J.C. (2013). River-floodplain hydrology of an embanked lowland Chalk river and initial response to embankment removal. Hydrological Sciences Journal 58, 627-650. Peh, K.S.-H., Balmford, A., Bradbury, R.B., Brown, B., Butchart, S.H.M., Hughes, F.M.R., Stattersfield, A., Thomas, D.H.L., Walpole, M., Bayliss, J., Gowing, D., Jones, J.P.G., Lewis, S.L., Mulligan, M., Pandeya, B., Stratford, C., Thompson, J.R., Turner, K., Vira, B., Willcock, S., Birch, J.C. (2013) TESSA: A toolkit for rapid assessment of ecosystem services at sites of biodiversity conservation importance, Ecosystem Services 5, 51-57. Thompson, J.R., Green, A.J., Kingston, D.G., Gosling, S.N (2013). Assessment of uncertainty in river flow projections for the Mekong River using multiple GCMs and hydrological models. Journal of Hydrology 486, 1-30. Thompson,J .R. (2012). Modelling the impacts of climate change on upland catchments in southwest Scotland using MIKE SHE and the UKCP09 probabilistic projections. Hydrology Research 43, 507–530. Oczkowski, A.J., Flower, R.J., Thompson, J.R., Ayache, F., Ahmed, M.H., Ramdani, M., Turner, S. (2011). Evidence of North Africa's green revolution preserved in sedimentary organic matter deposited in three coastal lagoons. Ecological Applications 21, 1708-1717. Kingston, D.G., Thompson, J.R., Kite, G. (2011). Uncertainty in climate change projections of discharge for the Mekong River Basin. Hydrology and Earth System Sciences 15, 1459-1471. Singh, C.R., Thompson, J.R., Kingston, D.G., French, J.R. (2011). Modelling water-level options for ecosystem services and assessment of climate change: Loktak Lake, northeast India. Hydrological Sciences Journal56(8), 1518-1542. Xu, H., Taylor, R.G., Kingston, D.G., Jiang, T., Thompson, J.R., Todd, M. (2010). Hydrological modelling of the River Xiangxi using SWAT2005: a comparison of model parameterizations using station and gridded meteorological observations. Quaternary International 226, 54-59. Singh, C.R., Thompson, J.R., French, J.R., Kingston, D.G., Mackay, A.W. (2010). Modelling the impact of prescribed global warming on runoff from headwater catchments of the Irrawaddy River and their implications for the water level regime of Loktak Lake, northeast India. Hydrology and Earth System Sciences 14, 1745-1765. Ahmed, M.H., Leithy, B.M., Thompson, J.R., Flower, R.J., Ramdani, M., Ayache, F., Hassan, S.M. (2009). Application of remote sensing to site characterisation and environmental change analysis of North African coastal lagoons. Hydrobiologia 622, 147-171. Ayache, F., Thompson, J.R., Flower, R.J., Boujarra, A., Rouatbi, F., Makina, H. (2009). Environmental characteristics, landscape history and pressures on three coastal lagoons in the Southern Mediterranean Region: Merja Zerga (Morocco), Ghar El Melh (Tunisia) and Lake Manzala (Egypt) Hydrobiologia 622, 15-43. Flower, R.J., Appleby, P.G., Thompson, J.R., Ahmed, M.H., Ramdani, M., Chouba, L., Rose, N., Rochester, R., Ayache, F., Kraiem, M.M., Elkhiati, N., El Kafrawy, S., Yang, H., Rasmussen, E.K. (2009). Sediment distribution and accumulation in lagoons of the Southern Mediterranean Region (the MELMARINA Project) with special reference to environmental change and aquatic ecosystems. Hydrobiologia 622, 85-112. Flower, R.J., Thompson, J.R. (2009). An overview of integrated hydro-ecological studies in the MELMARINA Project: monitoring and modelling coastal lagoons-making management tools for aquatic resources in North Africa. Hydrobiologia 622, 3-14. Kingston, D.G., Todd, M.C., Taylor, R.G., Thompson, J.R. and Arnell, N.W. (2009). Uncertainty in the estimation of potential evapotranspiration under climate change. Geophysical Research Letters 36, L20403. Kraiem, M.M., Chouba, L., Ramdani, M., Ahmed, M.H., Thompson, J.R., Flower, R.J. (2009). The fish fauna of three North African lagoons: specific inventories, ecological status and production. Hydrobiologia 622, 133-146. Mileham, L., Taylor, R.G., Todd, M., Tindimugaya, C., Thompson, J.R. (2009). The impact of climate change on groundwater recharge and runoff in a humid, equatorial catchment: sensitivity of projections to rainfall intensity. Hydrological Sciences Journal 54(4), 727-738. Ramdani, M., Elkhiati, N., Flower, R.J., Thompson, J.R., Chouba, L., Kraiem, M.M., Ayache, F., Ahmed, M.H. (2009). Environmental influences on the qualitative and quantitative composition of phytoplankton and zooplankton in North African coastal lagoons. Hydrobiologia 622, 113-131. Rasmussen, E.K., Petersen, O.S., Thompson, J.R., Flower, R.J., Ahmed, M.H. (2009). Hydrodynamic-ecological model analyses of the water quality of Lake Manzala (Nile Delta, Northern Egypt) Hydrobiologia 622, 195-220. Rasmussen, E.K., Petersen, O.S., Thompson, J.R., Flower, R.J., Ayache, F., Kraiem, M., Chouba, L. (2009). Model analyses of the future water quality of the eutrophicated Ghar El Melh lagoon (Northern Tunisia) Hydrobiologia 622, 173-193. Thompson, J.R., Flower, R.J., Ramdani, M., Ayache, F., Ahmed, M.H., Rasmussen, E.K., Petersen, O.S. (2009). Hydrological characteristics of three North African coastal lagoons: insights from the MELMARINA project. Hydrobiologia 622, 45-84. Thompson, J.R., Flower, R.J. (2009). Environmental science and management of coastal lagoons in the Southern Mediterranean Region: key issues revealed by the MELMARINA Project. Hydrobiologia 622, 221-232. Thompson, J.R., Flower, R.J. (2009). Hydro-ecological Monitoring and Modelling of North African Coastal Lagoons Preface. Hydrobiologia 622, 1-2. Mileham, L., Taylor, R.G., Thompson, J.R., Todd, M., Tindimugaya, C (2008). Impact of rainfall distribution on the parameterisation of a soil-moisture balance model of groundwater recharge in equatorial Africa. Journal of Hydrology 359, 46-58. Chouba, L., Kraïem, M., Njimi, W., Tissaoui, C.H., Thompson, J.R., Flower, R.J. (2007). Seasonal variations of heavy metals (Cd, Pb, and Hg) in sediments and in mullet, Mugil cephalus (Mugilidae) from the Ghar El Mehl Lagoon (Tunisia) Transitional Waters Bulletin 4, 45-52. Duranel, A.J.Acreman, M.C.Stratford, C.J., Thompson, J.R., Mould, D.J (2007). Assessing hydrological suitability of the Thames floodplain for species-rich meadow restoration. Hydrology and Earth System Sciences 11(1), 170-179. Gasca-Tucker, D.L. Acreman, M.C. Agnew, C.T., Thompson, J.R. (2007). Estimating evaporation from a wet grassland. Hydrology and Earth System Sciences 11(1), 270-282. Mumba, M., Thompson, J.R. (2005). Hydrological and ecological impacts of dams on the Kafue Flats floodplain system, southern Zambia. Physics and Chemistry of the Earth 30, 442-447. Thompson, J.R. (2004). Simulation of wetland water level manipulation using coupled hydrological/hydraulic modelling. Physical Geography 25(1), 39-67. Thompson, J.R., Refstrup-Sørenson, H., Gavin, H., Refsgaard, A. (2004). Application of the coupled MIKE SHE / MIKE 11 modelling system to a lowland wet grassland in Southeast England. Journal of Hydrology 293(1-4), 151-179. Nguyen, N.T., Nakabayashi, K., Mohapatra, P.K., Thompson, J.R., Fujita, K. (2003). Effect of nitrogen deficiency on biomass production, photosynthesis, carbon partitioning, and nitrogen nutrition status of Melaleuca and Eucalyptus species. Soil Science and Plant Nutrition 49, 99-109. Nguyen, T.N., Nakabayashi, K., Thompson, J.R., Fujita, K. (2003). Role of exudation of organic acids and phosphate in aluminium tolerance of four tropical woody species. Tree Physiology 23, 1041-1050. Al Khudhairy, D.H.A., Leemhuis, C., Hoffman, V., Shepherd, I.M., Calaon, R., Thompson, J.R., Gavin, H., Gasca-Tucker, D., Zalidis, G., Bilas, G., Papadimos, D. (2002). Monitoring wetland ditch water levels using Landsat TM and ground-based measurements. Photogrammetric Engineering and Remote Sensing 68(8), 809-818. Al Khudhairy, D.H.A., Leemhuis, C., Hoffmann, V., Calaon, R., Shepherd, I.M., Thompson, J.R., Gavin, H., Gasca-Tucker, D.L. (2001). Monitoring wetland ditch water levels in the North Kent Marshes, UK, using Landsat TM imagery and ground-based measurements. Hydrological Sciences Journal 46(4), 585-597. Nakabayashi, K., Nguyen, T.N., Thompson, J.R., Fujita, K. (2001). Effect of embankment on growth and mineral uptake of Melaleuca cajuputi Powell under acid sulphate conditions. Soil Science and Plant Nutrition 47(4), 711-725. Lemly, A.D., Kingsford, R.T. Thompson, J.R. (2000). Irrigated Agriculture and Wildlife Conservation: Conflict on a Global Scale. Environmental Management 25(5), 485-512. Shepherd, I.M., Wilkinson, G., Thompson, J.R. (2000). Measuring surface water storage in the north Kent marshes using Landsat-TM images. International Journal of Remote Sensing 9, 1843-1865. Thompson, J.R., Polet, G. (2000). Hydrology and land use in a Sahelian floodplain wetland. Wetlands 20(4), 639-659. Al Khudhairy, D., Thompson, J.R., Gavin, H., Hamm, N.A.S. (1999). Hydrological modelling of a drained grazing marsh under agricultural land use and the simulation of restoration management scenarios. Hydrological Sciences Journal 44(6), 943-971. Barbier, E.B., Thompson, J.R. (1998). The value of water: floodplain versus large-scale irrigation benefits in northern Nigeria. Ambio 27(6), 434-440. Hollis, G.E., Thompson, J.R. (1998). Hydrological data for wetland management. Water and Environment Journal, 12(1), 9-17. Thompson, J.R., Hollis, G.E. (1995). Hydrological Modeling and the Sustainable Development of the Hadejia-Nguru Wetlands, Nigeria. Hydrological Sciences Journal 40(1), 97-116. Yang, H., Ma, M., Thompson, J.R., Flower, R.J. (2018) Transport expansion threatens the Arctic. Science 359, 646–647. Yang, H., Flower, R.J., Thompson, J.R. (2018) Identify and punish ozone depleters. Nature 560, 167. Yang, H., Ma, M., Flower, R.J., Thompson, J.R., Ge, W. (2017) Preserve Precambrian fossil heritage from mining. Nature Ecology & Evolution 1, 1048–1049. Yang, H., Ma, M., Thompson, J.R., Flower, R.J. (2017) Reform China’s fisheries subsidies. Science 356, 1343. Yang, H., Ma, M., Thompson, J.R., Flower, R.J. (2017) Protect coastal wetlands in China to save endangered migratory birds. Proceedings of the National Academy of Sciences, 201706111. Yang, H., Clarke, J.L., Thompson, J.R. (2016) Nuclear energy: improve collaboration. Science 353, 1107. Yang, H., Huang, X., Thompson, J.R., Bright, R.M., Astrup, R. (2016) The crushing weight of urban waste. Science, 351 674–674. Yang, H., Huang, X., Thompson,J .R., Flower, R.J. (2016) Chinese landfill collapse: urban waste and human health. Lancet Global Health 4, e452. Yang, H., Huang, X., Thompson, J.R. (2015). Biochar: Pros must outweigh cons. Nature 517, 258–260. Yang, H., Huang, X., Thompson, J.R., Flower, R.J. (2015). Enforcement key to China’s environment. Science 347, 844–835. Yang, H., Thompson, J.R., Flower, R.J. (2015) Beijing 2020: Olympics will make water scarcity worse. Nature 525, 455. Yang, H., Thompson, J.R., Flower, R.J. (2015) Improve oversight of fracking in China. Nature 522, 34. Yang, H., Huang, X., Thompson, J.R. (2014). Tackle pollution from solar panels. Nature 509, 563. Yang, H., Huang, X., Thompson, J.R., Flower, R.J. (2014). China's soil pollution: urban brownfields. Science 344, 691-692. Yang, H., Thompson, J.R. (2014). China: Shale gas is a fraught solution to emissions. Nature 513, 315. Yang, H., Thompson, J.R., Flower, R.J. (2014). Earthshaking energy development plans. Science 346, 710–711. Yang, H., Flower, R.J., Thompson, J.R. (2013). Shale-gas: pollution fears in China. Nature 449, 154. Yang, H., Flower, R.J., Thompson, J.R. (2013). Shale-gas plans threaten China's water resources. Science 340, 1288. Yang, H., Flower, R.J., Thompson, J.R. (2013). Sustaining China's water resources. Science 339, 141. Yang, H., Flower, R.J., Thompson, J.R. (2013). China’s new leaders offer green hope. Nature 493, 163. Yang, H., Flower, R.J., Thompson, J.R. (2012). Rural factories won’t fix Chinese pollution. Nature 490, 342-343. Thompson, J.R. (1998). Hydrology and wetland conservation in Northeast Nigeria. Bulletin of the Society of Wetland Scientists 15(2), 9-10. Robinson, A.J., Thompson,J.R., Rahman, M., Rickards, N.J., Laizé, C.L.R., Houghton-Carr, H., Griffin,A ., Stewart, L., Formetta, G., Acreman, M.C., Thomas, T., Nema, M., Mishra, P., Gaur, S., Agarwal, P., Singh, Y., Jain, S., Kalai, C., Mondal, A. (2018). Development of understanding in hydro-climate services in India to inform food and water security: Final report. Report to NERC. London: UCL Department of Geography, Wallingford: Centre for Ecology and Hydrology, Roorkee: National Institute of Hydrology, Bombay: Indian Institute of Technology. Robinson, A.J., Thompson, J.R., Acreman, M.C., Lehmann, K., Dumont, E.L., Rickards, N.J., Thomas, T., Nema, M., Mishra, P., Gaur, S., Agarwal, P., Singh, Y., Jain, S. (2016). Building joint India-UK capacity, capability, research and innovation in the environment: Final report. Report to NERC. London: UCL Department of Geography, Wallingford: Centre for Ecology and Hydrology, Roorkee: National Institute of Hydrology. Acreman, M.C., Blake, J.R., Mountford, O., Stratford, C., Prudhomme, C., Kay, A., Bell, V., Gowing, D., Rothero, E., Thompson, J.R., Hughes, A., Barkwith, A. van de Noort, R. (2012). Guidance on using wetland sensitivity to climate change tool-kit. A contribution to the Wetland Vision Partnership. Centre for Ecology and Hydrology, Wallingford, UK. Old, G., Laize, C., Nottage, A., Acreman, M., Mountford, O., Thompson, J.R., Cowx, I., Walton, S., Thorne, C., Packman, J, Ramsbottom, D. (2011). Ecological impact assessment tools for fluvial flooding and coastal inundation - Technical Report SC060062. Bristol: Environment Agency. Acreman, M.C., Blake, J.R., Thompson, J.R., Hughes, A., Backwith, A., van der Noort. R., Gowing, D.J. Mountford, O., Stratford, C. (2010). Wetland vision: adapting freshwater wetlands to climate change: Literature Review. Report to the Environment Agency (CEH, UCL, BGS, Exeter University and Open University). Old, G., Thompson, J.R., Ramsbottom, D., Nottage, A., Packman, J., Thorne, C., Booker, D., Fisher, J., Durell, S., Acreman, M., Bolland, J., Cowx, I.G., Pinder, A., Mountford, O., Laize, C., Lumbroso, D. (2008). Methods to Assess, Model and Map the Environmental Consequences of Flooding. Literature review - Science Report SC060062. Bristol: Environment Agency. Flower, R.J., Thompson, J.R. (2006). MELMARINA: Monitoring and modelling coastal lagoons: Making management tools for aquatic resources in North Africa: Final Report. IC..-CT- 2002-10009. London: Wetland Research Unit & Environmental Change Research Centre, Department of Geography, UCL. Thompson, J.R., Ni, D.V., Shulman, D., Triet, T. van der Shans, M. (2006). Integrated Water and Fire Management Strategy - Tram Chim National Park. Cau Lanh: UNDP/ IUCN/MRC/GEF Mekong Wetlands Biodiversity Programme. Thompson, J.R., Ni, D.V., Shulman, D., Triet, T. van der Shans, M. (2005). Tram Chim National Park: Interim Period Scientific Workplan (2005-2006) Cau Lanh: UNDP/ IUCN/MRC/GEF Mekong Wetlands Biodiversity Programme. Thompson, J.R., Ni, D.V., Shulman, D., Triet, T. van der Shans, M. (2005). Tram Chim National Park: Interim Water and Fire Management Strategy (2005-2006). Cau Lanh: UNDP/ IUCN/MRC/GEF Mekong Wetlands Biodiversity Programme. Al-Khudhairy, D.H.A., Leemhuis, C., Hoffmann, V., Shepherd, I.M., Thompson, J.R., Gavin, H., Gasca-Tucker, D., Zalidis, G., Bilas, G., Refstrup Sorenson, H., Refsgaard, A., Papadimos, D., Argentieri, A. (2001), System for HYdrology using Land Observation for model Calibration: Final Report. EUR 19755 EN. Ispra: Joint Research Centre. Thompson, J.R. (2000). U Minh Thuong Nature Reserve: Hydrological Analysis Report, Year 1 - Report to CARE International in Vietnam and the U Minh Thuong Reserve Management Committee. London: Wetland Research Unit, Department of Geography, University College London. Agnew, C.T., Thompson, J.R. (1999). Wetland Evaporation: North Kent Marshes, End of Project Report to NERC, Grant Reference Number: GR9/3434. London: Wetland Research Unit, Department of Geography, University College London. Thompson, J.R. (1999). U Minh Thuong Nature Reserve: Hydrometeorological Data Processing Manual - Report to CARE International in Vietnam and the U Minh Thuong Reserve Management Committee. London: Wetland Research Unit, Department of Geography, University College London. Thompson, J.R. (1999). U Minh Thuong Nature Reserve: Hydrometeorological Instrumentation Manual - Report to CARE International in Vietnam and the U Minh Thuong Reserve Management Committee. London: Wetland Research Unit, Department of Geography, University College London. Thompson, J.R. (1999). U Minh Thuong Nature Reserve: Hydrometeorological Observations Manual - Report to CARE International in Vietnam and the U Minh Thuong Reserve Management Committee. London: Wetland Research Unit, Department of Geography, University College London. Goes, B.J.M., Thompson, J.R., Bdliya, H.H. (1997). Water Management of the Basin. In HNWCP Water Management Options for the Hadejia-Jama’are-Yobe River Basin, Northern Nigeria. Nguru: Hadejia-Nguru Wetlands Conservation Project. Hughes,J .M.R., Ayache, F., Hollis, G.E., Mamouri, F., Avis, C., Giansante C., Thompson, J.R. (1997). A Preliminary Inventory of Tunisian Wetlands - Report to EEC (DG XII), Ramsar Bureau and US Fish and Wildlife Service. London: Wetland Research Unit, Department of Geography, University College London. Polet, G., Thompson, J.R. (1997). Water Management Principles for the Hadejia-Jama’are-Yobe River Basin. In HNWCP Water Management Options for the Hadejia-Jama’are-Yobe River Basin, Northern Nigeria. Nguru: Hadejia-Nguru Wetlands Conservation Project. Thompson, J.R. (1997). Hydrological Research in the North Kent Marshes: A summary of Activities and Data Acquisitions - Report to the EU Joint Research Centre. Ispra. London: Wetland Research Unit, Department of Geography, University College London. Thompson, J.R., Gavin, H. (1997). Ongoing Hydrological Research in the Elmley Marshes, North Kent - Report to the EU Joint Research Centre. Ispra. London: Wetland Research Unit, Department of Geography, University College London. Thompson, J.R., Goes, B.J.M. (1997). Inundation and Groundwater Recharge in the Hadejia-Nguru Wetlands, Northeast Nigeria: Hydrological Analyses - Report to IUCN and WWF. London: Wetland Reseach Unit, Department of Geography, University College London. Thompson, J.R., Hollis, G.E. (1996). The Hydrological Functioning of the North Kent Marshes - Report to the EU Joint Research Centre. Ispra. London: Wetland Research Unit, Department of Geography, University College London. Thompson, J.R., Goes, B.J.M., Polet, G., Zabudum, A. (1995). A Proposal for Artificial Flood Releases for the Hadejia-Jama'are Basin in the 1995 Wet Season. Nguru: Hadejia-Nguru Wetlands Conservation Project (HNWCP). Hollis, G.E., Fennessy, S., Thompson, J.R. (1993). A249 Iwade to Queenborough: Wetland Hydrology: Final Report, Report to Ove Arup and Partners. London: Wetland Research Unit, Department of Geography, University College London. Thompson, J.R. (1993). Hydrological Model of the Hadejia Nguru Wetlands, Northern Nigeria: Update - Report to IUCN and RSPB. London: Wetland Research Unit, Department of Geography, University College London. Thompson, J.R. (1993). Hydrological Survey of the Hadejia-Nguru Wetlands, Northern Nigeria: Wet Season 1993 - Report to IUCN and RSPB. London: Wetland Research Unit, Department of Geography, University College London. Thompson, J.R. (1993). The 1992 Wet Season Hydrological Survey of the Hadejia-Nguru Wetlands, Northern Nigeria - Report to IUCN and RSPB. London: Wetland Research Unit, Department of Geography, University College London. Thompson, J.R., Hollis, G.E. (1993). Water Management in the Komadougou-Yobe Basin: Some Questions and Answers - Report to the Hadejia-Nguru Wetlands Conservation Project. London: Wetland Research Unit, Department of Geography, University College London. Hollis, G.E., Thompson, J.R. (1992). The Hydrological Foundations of the Sustainable Development of the Kizilirmak Delta, Turkey, Report to DHKD. London: Station Biologique de la Tour du Valat & Wetland Research Unit, Department of Geography, University College London. Thompson, J.R. (1992). Hadejia-Nguru Wetlands, Northern Nigeria: 1991 Hydrological Survey - Report to IUCN and RSPB. London: Wetland Research Unit, Department of Geography, University College London. Thompson, J.R. (1992). Hydrological Model of the Hadejia Nguru Wetlands, Northern Nigeria - Report to IUCN and RSPB. London: Wetland Research Unit, Department of Geography, University College London. Hudson, C.E., Thompson, J.R. (2018) Impacts of climate change on river flows in Siberia’s Lena River Basin and implications for the Atlantic Meridional Overturning Circulation. Hydrology: Advances in Theory and Practice, British Hydrological Society National Hydrology Symposium, 12–13 September 2018. Thompson, J.R., Laizé, C.L.R., Acreman, M.C., Li, S., Sith, R., Bunpov, V. Robinson, A.J. (2018) Development and application of the Ecological Risk due to Flow Alteration (ERFA) methodology in Cambodia – Progress on the TEFRIC Project. Hydrology: Advances in Theory and Practice, British Hydrological Society National Hydrology Symposium, 12–13 September 2018. Duranel, A., Thompson, J.R., Burningham, H., Cubizolle, H., Durepaire, P. (2017) Modelling the hydrological impacts of catchment afforestation on a headwater peatland in central France. EGU General Assembly, Vienna, Austria, 23–28 April 2017. Duranel, A., Thompson, J.R., Burningham, H., Cubizolle, H., Durepaire, P. (2017) Hydrology of an acidic valley mire in a granitic headwater catchment of the French Massif Central. EGU General Assembly, Vienna, Austria, 23–28 April 2017. Thompson, J.R., Iravani, H., Clilverd, H.M., Sayer, C.D., Heppell, C.M., Axmacher, J.C. (2017) Hydrological impacts of climate change on a restored UK floodplain: simulation results using MIKE SHE / MIKE 11 and UKCP09 scenarios. International Association of Hydrological Sciences 2017 Scientific Assembly, Port Elizabeth, South Africa, 10–14 July 2017. Thompson, J.R., Laize, C.L.R., Acreman, M.C., Crawley, A., Kingston, D.G. (2017) GCM-related uncertainty in future environmental flows and flooding in the Upper Niger and Inner Niger Delta. International Association of Hydrological Sciences 2017 Scientific Assembly, Port Elizabeth, South Africa, 10–14 July 2017. Duncan, C., Primavera, J.H., Thompson, J.R., Koldewey, H.J. Pettorelli, N. (2016) Biodiversity influences on mangrove forest ecosystem services delivery. Mangrove & Macrobenthos Meeting (MMM4), St. Augustine, USA, 18–22 July 2016. Duranel, A., Thompson, J.R., Burningham, H., Cubizolle, H., Durepaire, P. (2016). Integrated hydrological modelling of a groundwater-dependent valley mire in central France. Groundwater: Managing our Hidden Asset. Birmingham, UK, 13–14 September 2016. Duranel, A., Thompson, J.R., Burningham, H., Cubizolle, H., Durepaire, P. (2016). Groundwater dependence of acidic valley mires in basement regions: field and modelling evidence from the Massif Central (France). Groundwater: Managing our Hidden Asset. Birmingham, UK, 13–14 September 2016. Duranel, A., Thompson, J.R., Burningham, H., Cubizolle, H., Durepaire, P. (2016). Modelling the impacts of catchment afforestation on the hydrological condition of groundwater-dependent acidic valley mires. Groundwater: Managing our Hidden Asset. Birmingham, UK, 13–14 September 2016. House, A.R., Thompson, J.R., Acreman, M.C. (2016) Use of 1D hydraulic models to assess habitat sensitivity: a case study from Boxford, UK.ISE2016: International Symposium on Ecohydraulics, Melbourne, Australia. 7–12 February 2016. Clilverd, H.M., Thompson, J.R., Heppell, C.M., Sayer, C.D., Axmacher, J.C. (2015) Removal of river embankments and the modelled effects on river-floodplain hydrodynamics. EGU General Assembly, Vienna, Austria, 12–17 April 2015. House, A.R., Acreman, M.C., Sorensen, J.P.R., Thompson, J.R. (2015) Hydroecological impacts of climate change modelled for a lowland UK wetland. EGU General Assembly, Vienna, Austria, 12–17 April 2015. House, A.R., Acreman, M.C., Thompson, J.R. (2015) Modelling the hydroecological implications of climate change for a lowland UK wetland.HydroEco'2015, Vienna, Austria, 13–16 April 2015. Green, A.J, Thompson, J.R., Kingston, D.G., Gosling, S.N. (2014). Quantifying the relative magnitude of sources of uncertainty in river flow projections under climate change: an assessment for the Mekong River. European Geosciences Union General Assembly 2014, Vienna, Austria, 27 April-2 May 2014. Acreman, M.C., Blarke, J.R., Thompson, J.R. (2013) Projecting uncertain impacts of climate change on wetlands: a risk-based web tool for England and Wales. Wetland Systems: Ecology, Functioning and Management, Padova, Italy, 1-4 September 2013. Duranel, A., Thompson, J.R., Burningham, H., Cubizolle, H., Roberts, C. (2013). Evaluation of the use of PVC to estimate water table depth exceedence frequency curves in wetlands. Intecol 2013, London, UK, 18-23 August 2013. Thompson, J.R., Crawley, A., Kingston, D.G. (2013). Climate change and the Inner Niger Delta – An assessment of GCM-related uncertainty. Wetland Systems: Ecology, Functioning and Management, Padova, Italy, 1-4 September 2013. Clilverd, H.M., Thompson, J.R., Sayer, C.D., Heppell, C.M., Axmacher, J.C. (2012) Ecohydrology of an Embanked Lowland UK River Meadow and the Effects of Embankment Removal. American Geophysical Union Fall Meeting, San Francisco, USA, 3-7 December 2012. Acreman, M.C., Blake, J., Mountford, J.O., Gowing, D., Thompson, J.R., van de Noort, R., Hughes, A.G., Barkwith, A.K.A.P., Skinner, A., Orr, H.G., O’Neill, A., Tanner, K., Everard,M., Moorcroft, M., Shaw, R., Heathcote, J., Burston,P., Perkins, H. (2011). Wetland vision and climate change: tools for impact assessment.British Ecological Society / Natural England conference: Adapting Conservation to a Changing Climate. London, UK, 11-12 January 2011. Duranel, A., Thompson, J.R., Cubizolle, H., Burningham, H. (2011). Assessing the potential impact of climate change on mire habitats in Central France : a multi-scale eco-hydrological approach. Wetland vision and climate change: tools for impact assessment. British Ecological Society / Natural England conference: Adapting Conservation to a Changing Climate. London, UK, 11-12 January 2011. Li, Y., Thompson, J.R., Taylor, R., Li, H. (2010). Sensitivity analysis and calibration of the SWAT model: understanding model behavior in hydrological studies of the Daning Catchment, China. British Hydrological Society Third International Symposium, Newcastle upon Tyne, UK, 19-23 July 2010. Clilverd, H.M., Thompson, J.R., Heppell, C.M., Sayer, C.D., Axmacher, J.C. (2009). Hydrological restoration of river-floodplain connections and the effects on wet grassland plant communities. Hydro-Eco’2009, Vienna, Austria, 20-23 April 2009. Kingston, D.G., Taylor, R.G., Todd, M., Thompson, J.R. (2009). Impact of climate change on freshwater resources: an inter-basin comparison using a consistent set of climate and development scenarios. EGU General Assembly, Vienna, Austria, 19-24 April 2009. Kingston, D.G., Todd, M., Taylor, R.G., Thompson, J.R. (2009). Uncertainty in the potential evapotranspiration climate change signal. RMetS Conference 2009, Reading, UK, 29 June-2 July 2009. Kingston, D.G., Todd, M., Taylor, R.G., Thompson, J.R. Arnell, N.G. (2009). Uncertainty in PET estimation associated with climate change. EGU General Assembly, Vienna, Austria, 19-24 April 2009. Mileham, L., Taylor, R.G., Todd, M. Thompson, J.R. Tindimugaya, C. (2008). The impact of climate change on groundwater recharge and runoff in a humid, equatorial catchment of Uganda. International Conference on Groundwater & Climate in Africa, Kampala Uganda, 24-28 June 2008. Mould, D.J., Acreman, M.C, Thompson, J.R. (2008). The importance of initial model conceptualisation in hydrodynamic modelling for assessment of wetland hydrological functioning. HydroPredict Conference, Prague, Czech Republic, 15-18 September 2008. Owor, M., Taylor, R.G., Thompson, J.R., Mukhaya, C., Tindimugaya, C. (2008). Preliminary results from recent monitoring of groundwater / surface-water interactions in the Victoria Nile basin of Uganda. International Conference on Groundwater & Climate in Africa, Kampala Uganda, 24-28 June 2008. Singh, C.R., Thompson, J.R., Kingston, D. (2008). Hydrological modelling of climate change impacts on Loktak Lake, India. Wetlands and Global Climate Change, Portland, Oregon, USA, 16-18 September 2008. Thompson, J.R. (2008). Assessment of climate change impacts on the Elmley Marshes, UK using the MIKE SHE / MIKE 11 modelling system.Wetlands and Global Climate Change, Portland, Oregon, USA, 16-18 September 2008. Xu, H., Taylor, R.G., Kingston, D.G., Thompson, J.R., Todd, M. (2008). Hydrological modelling of the River Xiangxi using SWAT2005: comparison of model parameterizations using station and gridded meteorological observations. 2008 SWAT International Conference, Beijing, October 17-19 2008. Beijing:Beijing Normal University. Chambers, C., Ayache, F., Petersen, O., Rasmussen, E., Chouba, L., Flower, R.J., Thompson, J.R., Kraiem, M. (2006). Hydrodynamic-ecological Modelling of a Southern Mediterranean Lagoon: Ghar El Melh, North-east Tunisia. Environmental Change in Lakes, Lagoons & Wetlands of the Southern Mediterranean Region (ECOLLAW), Cairo, Egypt, January 4-7 2006. Elkhiati, N., Ramdani, M., Flower, R.J., Ayache, F. Chouba, L, Chambers, C., Thompson, J.R. (2006). Hydrological Influences on the Qualitative and Quantitative Composition of Phytoplankton in Two North-African Lagoons: Moulay Bousselham (Morocco) and Ghar El Melh (Tunisia).Environmental Change in Lakes, Lagoons & Wetlands of the Southern Mediterranean Region (ECOLLAW), Cairo, Egypt, January 4-7 2006. Flower, R.J., Chambers, C., Rochester, R., Thompson, J.R., Rose, N., Yang, H., Ahmed, M.H., Ramdani, M., Ayache, F., Kraïem, M., El Kafrawy. S., Rasmussen, E.K., Appleby, P.G. (2006). Current and past status of some North African Coastal Wetland Lagoons with Special Reference to Sediment Accumulation.Environmental Change in Lakes, Lagoons & Wetlands of the Southern Mediterranean Region (ECOLLAW), Cairo, Egypt, January 4-7 2006. Thompson, J.R. (2006). The Importance of Hydrological Monitoring for Wetland Science, Management and Conservation. Environmental Change in Lakes, Lagoons & Wetlands of the Southern Mediterranean Region (ECOLLAW), Cairo, Egypt, January 4-7 2006. Chambers, C.E., Thompson, J.R., Flower, R.J., Petersen, O., Rasmussen, E., Ayache, F., Chouba, L., Kraiem, M. (2004). Hydrodynamic-Ecological Modelling of a Southern Mediterranean Lagoon: Ghar El Melh, North-east Tunisia. Challenger Conference for Marine Science, Liverpool, UK, 13-17September 2004. Mumba, M., Thompson, J.R. (2004). Consequences of River Basin Development - the Case of the Kafue Flats Floodplain System Southern, Zambia and the Environmental Impacts from Damming. 1st General Assembly of the European Geosciences Union, Nice, France, 25-30 April 2004. Thompson, J.R. (2003). Coupled Hydrological / Hydraulic Modelling of the Elmley Marshes, Southeast England. Annual Meeting of the American Association of Geographers, New Orleans, USA, 5-8 March 2003. Saich,P ., Thompson, J.R. and Rebelo, L. (2001). Monitoring Wetland Extent and Dynamics in the Cat Tien National Park, Vietnam, Using Space-Based Radar Remote Sensing. IGARSS (International Geoscience and Remote Sensing Symposium) 2001, Sydney, Australia 9-13 July 2001. Thompson, J.R., Al-Khudhairy, D.H.A., Calaon, R., Shepherd,I .M., Hoffman, V., Gavin, H., Gasca-Tucker, D., Refstrup Sørensen, H., Refsgaard, A., Bilas, G., Zalidis, G. and Papadimos, D. (2000). Innovative Technologies for Scientific Wetland Management and Conservation. Remote Sensing and Hydrology 2000, Santa Fe, New Mexico, USA, 3-7 April 2000. Al-Khudhairy, D.H.A., Shepherd, I.M., Langhoff, A., Calaon, R., Hoffmann, V., Thompson, J.R., Agnew, C.T., Gavin, H., Gasca-Tucker, D., Zalidis, G., Bilas, G., Hadjikiannis, S., Refsgaard A., Refstrup Sørensen, H. (1999). New Integrated Technologies for Wetland Management and Protection. 3rdDHI Software Conference, Helsingør, Denmark, 7-11 June 1999. Shepherd, I.M., Al Khudhairy, D., Kaiser, C., Thompson, J.R., Zalidis, G., Hadjiakiannakis, S., Refsgaard, A. (1998). SHYLOC: System for Hydrology Using Land Observation for Model Calibration. Medwet Workshop on Wetland Restoration in the Mediterranean, Thessaloniki, Greece, March 18 1998. Al-Khudhairy, D., Thompson, J.R. (1997). Modelling the Hydrology of an Underdrained Catchment and the Effects of Reverting it to its Former Natural State. Operational Water Management. Proceedings of The International Conference, Copenhagen, Refsgaard,J.C., Karalis,E.A. (ed.) Rotterdam:Balkema, 330-340. Shepherd, L., Al-Khudhairy, D., Thompson, J.R. (1997). Using Remote Sensing for Measuring Surface Water Storage in Wetlands. Operational Water Management. Proceedings of The International Conference, Copenhagen, Refsgaard,J.C., Karalis,E.A. (ed.) Operational Water Management. The International Conference, Copenhagen series. Rotterdam:Balkema, 73-82. Al Khudhairy, D, Thompson, J.R. and Shepherd, I.M. (1996). Modelling the Hydrology of the North Kent Grazing Marshes Using the Mike She Code. Wetlands for the Future, Intecol's V International Wetlands Conference, Perth, Australia, 22-28 September 1996. Thompson, J.R., Hollis, G.E. (1996). Wetlands: Maintenance, Valuation and Acceptance by Decision Makers.Rivers and Landscape: Ecological Concepts, Wurzburg, Germany, 20-22 May 1996. Thompson, J.R., Hollis, G.E. and James, E.J. (1995). Environmentally Sound Management of River Basins in Asia: Utilizing Wetland Functions and Maximising Wetland Benefits. International Conference on Wetlands and Development, Selangor, Malaysia, 8-14 October 1995. Stacey, D., Thompson, H., Thompson, J.R. (1994). The Impact of Further Irrigation Development in the Hadejia Jama'are Basin. Irrigation and Drainage Development in Africa, Institute of Civil Engineers, London, 22 March 1994. Thompson, J.R., Hollis, G.E. (1993). A Hydrological Model of a Sahelian Floodplain Wetland and its Use in the Formulation of Sustainable Development Options. XVIII General Assemply of the European Geophysical Society, Wiesbaden, Germany, 3-7 May 1993. Thompson, J.R. (1995). Hydrology, Water Management and Wetlands of the Hadejia Jama'are Basin, Northern Nigeria. University of London. Hydrological Research in the Hadejia-Nguru Wetlands, Nigeria (1991-1997). Funding: IUCN, RSPB, WWF. (i) Second phase of the Hadejia-Nguru Wetlands Conservation Project (1991-1994). Funding: the International Union for the Conservation of Nature (IUCN) and the Royal Society for the Protection of Birds (RSPB): field monitoring of wetland hydrological processes, (ii) development of a digital hydrological model of the river basin and its wetlands, (iii) development of a user friendly, menu driven graphical user interface for the model, (iv) training courses for the model in Nigeria for governmental and non-governmental organisations, (v) analysis of daily flow data and derivation of artificial flood hydrographs for dam releases, (vi) advising engineers and policy makers on water resource developments in the river basin. (ii) Third phase of the Hadejia-Nguru Wetlands Conservation Project (1994-1998). Funding: the International Union for the Conservation of Nature (IUCN) and the Royal Society for the Protection of Birds (RSPB): Provision of research based, technical advice regarding the operation and monitoring of wet season releases from large scale engineering schemes and the establishment of a coordinating council within the river basin. The research comprised hydrological monitoring of river flows and response within shallow aquifers and the further development of the hydrological model developed for the wetland and its catchment. (iii) Economic evaluation of groundwater recharge in the Hadejia-Nguru Wetlands (1995-1997). Funding: WWF through IUCN. A cross-disciplinary project undertaken with the Department of Environmental Economics and Management, University of York to develop research methodologies for the evaluation of the economic value of groundwater recharge beneath the large floodplain wetland. The research involved field hydrological investigations focussing on groundwater dynamics, economic surveys and hydrological modelling to establish relationships between inundation and recharge and the subsequent economic value of these hydrological processes. Environmental impact assessment of irrigation development in the Kizilirmak Delta, Turkey (1992). Funding: Turkish Society for the Protection of Nature (DHKD). A rapid appraisal of likely impacts of irrigation expansion following field visits and review and analysis of documentary sources and extant data. 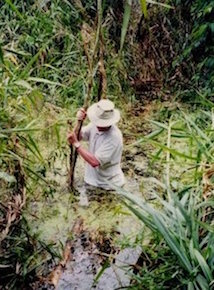 Hydrology of the North Kent Marshes (1992-1993). Funding: Ove Arup & Partners with support from the Department of Transport. Targeted field investigations and review of extant data to provide a comprehensive evaluation of the hydrology of the marshes and to advise on appropriate engineering designs for the proposed new road crossing onto the Isle of Sheppey. Hydrological monitoring and modelling of the North Kent Marshes, U.K and Lake Karla, Greece (1994-1998). Funding: European Commission through the Joint Research Centre, Ispra. Development of comprehensive monitoring programmes for two internationally important wetlands and the incorporation of monitoring data within state-of-the-art hydrological / hydraulic models. Guidelines for Environmentally Sound Management of River Basins in Asia: Utilizing Wetland Functions and Maximizing Wetland Benefits (1995-1996). Funding: United Nations Environment Programme / Asian Wetland Bureau (now Wetlands International). A comprehensive review of existing literature and the development of a series of case studies in order to develop regionally specific guidelines for wetland and water management The guidelines, which were widely disseminated throughout the region, were subsequently published as a Wetlands International / UNEP book. System for HYdrology using Land Observation for model Calibration (SHYLOC) (1997-2000). Funding: EU Framework IV Programme. A cross-disciplinary research project with partners in four European countries (JRC Ispra, Italy – Coordinator; UCL - Financial Coordinator; DHI, Denmark; and Aristotle University of Thessaloniki / Greek Biotope Wetland Centre, Greece) focussing on the development of remote sensing and hydrological modelling tools for wetland management supported by hydrological monitoring. The UCL focus was research in the North Kent Marshes including the application of coupled hydrological / hydraulic models to complex wetland environments which included innovative adaptations to existing modelling procedures. Wetland Evaporation: The North Kent Marshes (1998-1999). Funding: NERC Small Grant. Research into the controls on and spatial distribution of evaporation within lowland wet grasslands through novel high resolution monitoring of boundary layer meteorology. Hydrological monitoring of the U Minh Thoung Nature Reserve, Kien Giang Province, Vietnam (1999-2000). Funding: CARE International in Vietnam. Development of site specific hydrological monitoring programme and its integration with ecological research for the largest remaining area of peat swamp forest in the Mekong Delta, training of local observers and analysis of hydrological regimes. Monitoring and modelling coastal lagoons: Making management tools for aquatic resources in North Africa (MELMARINA) (2002-2006). Funding: EU Framework V INCO Med Programme. A cross-disciplinary (hydrology, ecology, remote sensing, fisheries, modelling) research project coordinated by UCL involving two European and four North African partners: UCL, DHI (Denmark), University of Sousse (Tunisia), Institut National Des Sciences et Technologies de la Mer, (Tunisia), Institut Scientifique, Rabat (Morocco) and the National Authority for Remote Sensing and Space Sciences (Egypt). The research pioneered the application of coordinated hydro-ecological monitoring within large North African lagoon environments as well as the application of state-of-the art coupled hydraulic / ecological models, the parameterisation of these models using remote sensing and their application to assess restoration options. See the special issue of Hydrobiologia (opens in new window). Water and Fire Management Strategy for Tram Chim National Park, Dong Thap Province, Vietnam (2005-2006). Funding: United Nation Development Programme / IUCN – The World Conservation Union / Mekong River Commission / Global Environment Facility funded Mekong Wetlands Biodiversity Programme (MWBP). Leading a team comprising cross-disciplinary scientists from the UK, USA, the Netherlands and Vietnam developing an integrated water and fire management strategy for the Park, the last remnants of the Plain of Reeds. The work included the development of a scientific workplan for field research over an 18-month period supported by a fire and water management strategy for this period in which experimental manipulations of Park management was undertaken. Research results were incorporated within large-scale infrastructure investments for future Park management. Global scale impacts of climate change: a multi-sectoral analysis (QUEST-GSI) (2007-2010). Funding: NERC. A cross-disciplinary project led by the Walker Institute, University of Reading involving a consortium of twelve partners funded under Theme 3 (Implications of global environmental changes for the sustainable use of resources) of the NERC QUEST programme. The project assessed the global-scale impact of climate change using a range of linked impact modules and impact indicators, representing impacts on water resources, flood risk, food production, biodiversity and human health and well-being on land, at the coast, and at sea. The UCL component focused on the evaluation of catchment scale water resource impacts of climate change through the development of hydrological models of a range of river basins around the world. Ecological Consequences of Flooding (2007-2011). Funding: Environment Agency. A cross-disciplinary project involving the Centre for Ecology and Hydrology, UCL, HR Wallingford, University of Nottingham and University of Hull. The project developed and tested research led methods for assessing the environmental (vegetation, birds, fish, invertebrates) consequences of riverine and coastal flooding. These included the development of original GIS based tools to integrate and maximise the utility of existing data sets held by the Environment Agency. Wetland Vision: Adapting wetlands to climate change (2009-2012). Funding: The Wetland Vision (English Heritage, Environment Agency, Natural England, RSPB and the Wildlife Trusts). A cross-disciplinary project involving the Centre for Ecology and Hydrology, the British Geological Survey, UCL, Open University and the University of Exeter. Research undertaken within the project involves the development of a novel tiered approach for assessing impacts and uncertainty of climate change on characteristics and features (hydrology, vegetation communities, birds and archaeology) of rain-fed, riverine and groundwater-fed wetlands. Approaches range from conceptual hydrological models used to simulate the full suite of UK Climate Impacts Programme UKCP09 scenarios (thousands of model runs) to case studies employing high resolution, fully distributed, physically-based hydrological / hydraulic models and a sub-set of climate projections. A tool developed by the project which provides an assessment of the impacts of climate change upon wetlands is available here: The Climate Change Assessment Tool (opens in new window). A iOS version of the tool has b=been developed with additional support from NERC and is available here: Wetland Tool (opens in new window). Developing a national capability framework for testing integrated surface – groundwater models (2011-2013). Funding: Centre for Ecology and Hydrology / British Geological Survey. The research aims to develop methods for designing and testing coupled models of cascading degrees of spatial complexity in order to better manage groundwater dependent ecosystems. The project uses Boxford meadows (Berkshire) as a laboratory to evaluate approaches for providing the necessary field data to develop conceptual understanding of groundwater-wetland interactions and to subsequently develop and evaluate results from models which will range from simple water balance type approaches to fully distributed, physically based surface / unsaturated / saturated zone models operating at very fine spatial scales. The latter models will be coupled to existing regional groundwater models providing a pioneering means of reconciling scale / computational resource mis-matches associated with fine scale wetland modelling and large scale aquifer models. Models will be used to assess the impacts of climate change and changing groundwater abstraction regimes. Building joint India-UK capacity, capability, research and innovation in the environment (2015-2016). Funding: NERC. A project undertaken in collaboration with the Centre for Ecology and Hydrology to scope approaches to improve water-related science in India with a focus on environmental flows. The project includes the development of a distributed hydrological model of the Narmada River Basin capable of providing river flow projections under a range of scenarios. Model results will be compared to those produced from large-scale gridded hydrological models and will be suitable for application to common environmental flow assessment methodologies. In addition, the project will undertake a pilot baseline assessment of microbial communities in water and soils along the large Indian rivers using metagenomic Next Generation sequencing. It will also review the potential of including sediment as part of environmental flow assessments. Water climate services to inform food and water security in India (2016-2017). Funding: NERC. A collaborative project with the Centre for Ecology and Hydrology (CEH, UK) and the National Institute of Hydrology, Roorkee, (India) focusing on water related ecosystem services in the face of climate change. The project will apply UCL-based hydrological models of the Narmada Basin (India) and the Barak-Kushiyara River Basin (India and Bangladesh) to explore potential uncertainties associated with alternative meteorological datasets and climate change scenarios. Impacts and uncertainty on ecosystem services will be assessed using simulated hydrological changes, information on water requirements for sectors including agriculture and HEP, and adoption of the risk-based environmental flow methodology developed through collaborative research between UCL and CEH. Translation of Environmental Flow Research in Cambodia (TEFRIC) (2017-2019). Funding: NERC (Innovation Follow-on). A collaborative project with the UK Centre for Ecology and Hydrology, the Institute of Technology of Cambodia and the Tonle Sap Authority (Cambodia) designed to introduce state-of-the-art environmental flow approaches to Cambodia and to initiate their application in the wider Mekong River Basin. The project will develop a documented, user-friendly open-access version of the Ecological Risk due to Flow Alteration (ERFA) code (using the R programming language). Working with hydro-ecological experts in SE Asia, ERFA will be tuned to the Cambodia situation using a wide range of projections of future Mekong River discharge provided by UCL-based hydrological modelling studies. Cambodian-specific scenarios will be developed in collaboration with local stakeholders with interests in water resources management and aquatic ecology. These scenarios will be simulated through hydrological modelling. ERFA will be used to assess scenario impacts on environmental flows with an emphasis on the implications for ecosystem service delivery. My research is strongly translational and has influenced environmental management in the UK and overseas. In the UK I have contributed to two major inter-disciplinary projects designed to provide tools for the Environment Agency as well as conservation bodies to enable them to evaluate the ecological consequences of flooding and the impacts of climate change upon the nation’s wetlands. The latter project has included the development of an online tool enabling regional assessments of climate change impacts on wetland hydrological characteristics and resources. Research on the environmental and economic impacts of dams upon African floodplains has been influential in shaping water management policies of international donors. Work undertaken in Nigeria under the auspices of IUCN’s African Wetlands Programme included training courses for Government Ministries and other agencies in hydrological modelling to raise awareness of catchment-wide integrated water management approaches. I led an international team developing an integrated water and fire management strategy for Tram Chim National Park, the largest remaining remnant of Vietnam’s once extensive Plain of Reeds. Recommendations from this strategy, which included large-scale infrastructure developments, were incorporated within a multi-million US$ five-year investment plan for the National Park. Research undertaken as part of the MELMARINA project, which I led, were utilised in the Tunisian Government’s site description of Ghar El Melh when listing the site as internationally important under the Ramsar Convention. The TEFRIC project is developing tools to enable the rapid assessment of the potential ecological impacts of changes in river flow due to factors that could include climate change, water resources management and land cover-intensification in Cambodia, the wider-Mekong and elsewhere. During the course of my overseas research I have provided training for environmental scientists and management practitioners in partner organisations that has enhanced their capacity to manage wetland environments. This has included training of Nigerian hydrologists from state water ministries in field hydrometric techniques and the rehabilitation of monitoring infrastructure, training in wetland hydrological modelling and data analysis for staff in both Cat Tien National Park and U Minh Thoung Nature Reserve, Vietnam, and hydro-ecological monitoring programme design and operation for environmental scientists in Egypt, Morocco and Tunisia. Students registered for these modules can obtain information through UCL’s Moodle system. Students wanting to discuss module-related issues during the summer term should, in the first instance, contact me by Email. I will also be available at the following time to discuss modules for the 2019/2020 academic year. 27 May Wednesday 29 May 10:00-12:00. Dr Michel Wortmann: Adaptation and implementation of the European, hydrological model SWIM to arid, glacier and snow melt water dominated catchments in NW China; German Government funding (Non-resident student); 2012-2018. Dr Amanda Robinson: Uncertainty in hydrological scenario modelling: An investigation using the Mekong River Basin, SE Asia; Department of Geography Post-Graduate IT Assistantship; 2012-2018. Dr Jessica Durkota: Groundwater ecology: invertebrate community distribution across the benthic, hyporheic and phreatic habitats of a chalk aquifer in Southeast England; Self funding with support from Environment Agency (part-time); 2008-2018. Dr Clare Duncan: Planning for change: managing mangroves in the face of climate change; UCL Beams Impact Award / Zoological Society of London; 2013-2017. Dr Andrew House: Ecohydrological impacts of climate change on a riparian chalk valley wetland; NERC-CEH Studentship.2012-2016. Dr Mohammed Rahman: Modelling climate change impacts on the water regimes of the river-wetland systems in the data-scarce transboundary Upper Meghna River Basin (Bangladesh and India); Ted Hollis Scholarship in Wetland Hydrology and Conservation; 2012-2016. Dr Elizabeth Gardner: The ecohydrology and conservation of a coastal sedimentary lake and wetland system: Sheskinmore Lough, Donegal, Ireland; UCL Graduate School Research Scholarship; 2011-2016. Dr Hannah Clilverd: Hydroecological monitoring and modelling of river-floodplain restoration in a lowland river meadow; UCL Department of Geography Post-graduate Teaching Assistantship (part-time); 2006-2016. Dr Arnaud Duranel: Hydrology and hydrological modelling of acidic mires in Central France; NERC Studentship; 2009-2015. Dr Michael Owor: Groundwater - surface water interactions on deeply weathered surfaces of low relief in the Upper Nile Basin of Uganda; Commonwealth Scholarship; 2007-2010. Dr Rebekah Rochester: Uncertainty in hydrological modelling: a case study in the Tern catchment, Shropshire, UK: UCL Department of Geography Post-graduate Teaching Assistantship; 2005-2010. Dr Chabungbam Rajagopal Singh: Hydrological and hydraulic modelling for the restoration and management of Loktak Lake, northeast India; Ted Hollis Scholarship in Wetland Hydrology and Conservation; 2005-2010. Dr Hong Yang: Spatial and temporal patterns of benthic diatoms in an upland Scottish loch (the Round Loch of Glenhead): with reference to recent environmental changes; NERC Dorothy Hodgkin Postgraduate Studentship; 2005-2009. Dr Lucinda Mileham: Impact of climate change on the terrestrial hydrology of a humid, equatorial catchment in Uganda; NERC Studentship: 2004-2008. Dr David Mould: Multi-scale assessment of wetland hydrological functioning at a wet grassland in southeast England: NERC-CEH Studentship: 2004-2008. Dr Musonda Mumba: Hydrological and vegetation changes in the Kafue Flats, Zambia following dam construction; Ted Hollis Scholarship in Wetland Hydrology and Conservation; 2001-2007. Dr Sian O'Dwyer: Monitoring forest cover and wetland sedimentation in Cat Tien National Park, Vietnam; NERC Studentship; 1999-2003. Dr Helen Gavin: Hydrology of the Elmley Marshes; UCL / Institute of Hydrology / EU / English Nature; 1996-2000. Dr David Gasca-Tucker: The hydrological functioning of the Pevensey Levels wetland; UCL Jackson Environment Institute / Institute of Hydrology / Environment Agency; 1995-2005. Yan Li: Assessment of the hydrological impacts of land use change in the Daning River Catchment, China using hydrological modelling; ORS UCL/CSC Scholarship; 2008-2013.